"Some of the comments have been wide off the mark from the realities on ground , that makes it imperative for our group to interject as a way of clarifying the issues with a view to understanding what actually are on ground. "Since the coming of the current administration, the Nigeria military has achieved a lot in terms of tackling insurgency that at for a long period of time it became difficult for the terrorists to operate or to launch attacks. "Many of their commanders were arrested within the period under review and brought to book, their operational bases blown to pieces and many of them surrendered due to fear and owing to the superiority of the military. "Many people living in Internally Displaced Persons, IDP, camps have relocated to their communities and many have been reunited with their families. Clear evidence of this can be seen on both local and international media across the world. "It is therefore not only beastly but also moronic for anybody who is conversant with the progress made within the period under review to try to cast aspersion on the military as an institution or on the person of the Chief of Army Staff, Lieutenant General Tukur Buratai. "The call by one CUPS and it’s Leader, one Idris Ahmed asking President Muhammadu Buhari, to sack the Chief of Army Staff, Lt. General Tukur Buratai, therefore not only lacks basis but is asinine if not insane. "The group masquerading as the authentic CUPS and registered in the United Kingdom has failed to point out how and where it arrived at the allegation that COAS is ‘incompetent in the face of aggressive insurgency,’ or where his action or inaction constitutes criminal negligence, or where he had lent himself to acts of corruption or conspiracy to defraud the Nigerian State or where any of his actions amounted to treachery. "A keen observer of the actions of the COAS would realize that all these allegations are none just non-existent but wickedly concocted for reasons not relating to security issues. "The COAS has since joining the army won some of the best awards and medals that the discipline offers and had served in very responsible positions while giving good account of himself in all the assignments given to him. "For somebody to wake up and accuse such a fine officer of incompetence shows that the person either does not know the meaning of the word or that he is trying to be mischievous. "Apart from the several awards he received within the country, Buratai’s efforts in fighting insurgency has been recognized worldwide and is evident in his receipt of the highest military award in Brazil in 2017 for the role he played in subduing insurgency in Nigeria. "It is to his credit that the insurgents no longer take hostages or stay to challenge the Nigerian state but flee at the sight of the Nigerian military. "There was not a single occasion where the attention of the military had been called to an operation requiring prompt action that it did not rise to the occasion, even in the latest attack at Gulumbari where it was taken by surprise, the military immediately regained composure, restrategised and relaunched and attack sending the terrorists running with the tails between their legs and recaptured the area. Pray, where then does the allegation of negligence come in? "Troops have not only been getting their allowances and other emoluments as at when due but weapons have been secured for them to fight the insurgents. Currently there is an order for more fighter planes which has been okayed by the government and every single penny invested in the fight has been proven to be worth the while. "It would have been a different story if the COAS had been engaged in corrupt practices or in a conspiracy to defraud the Nigerian state as this faceless and spineless group had alleged. "The issues of treachery does not even arise if the authors of the statement know the meaning of the word as Buratai has not only conducted himself in the most patriotic manner but has also imbued his troops with same level of patriotism and discipline that is unmatched in the history of the country. 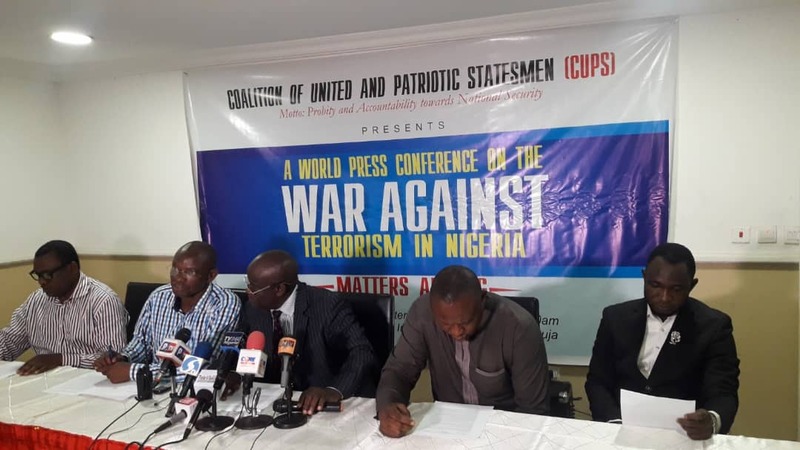 "We are therefore shocked at the unpatriotic posture being taken by this so called group and wish to agree with other CSOs that this fake CUPS is out to pursue the interest of terrorists and their sponsors.